The four powers by Nicholas Graham is a smart little primer on ceremonial magic. It is concise, neatly packaged and without all the fluff and incidental trivia that plagues current Wiccan and pagan books. In just four short chapters Graham puts into context everything a beginning practitioner needs to learn in order to make magic a lifetime practice. This book isn’t for dabblers or hobbyists. This is a book, no matter how small and condensed, for the serious magical practitioner. I like to think of it as the Elements of Style for the Ceremonial Magician. The chapters are broken down into To Know, To Dare, To Will and to Be silent. Further, these chapters demark the elements of Air, Fire, Water and Earth. Strangely, spirit isn’t included in the elements. But Graham himself states that this book isn’t written with a Wiccan slant. The first chapter is entitled to Know. It neatly outlines the meaning of ceremonial magic, discusses the definition of magic and how that definition has evolved over the centuries. He further goes into topics of magical models, or paradigms that describe how different practitioners approach magic and how they work with it. The Second Chapter is entitled To Will. In this chapter we find Graham giving us a brief study of various magical practices, termed “the five operations.” These are simply classifications of types of magic and magical practice. In this chapter he discusses topics such as divination, evocation and invocation as well as illumination and various studies on sigil practice. The third Chapter is called To Dare which works with mysticism and illumination. He tells the reader what illumination is, goes into greater depth about the practice of mysticism and gives a brief discussion into the topic of enlightenment. This, as in all chapters are experiments the student can do as well as go through the reading lists in the back of each chapter. The fourth and final chapter is called, To Keep Silent. In this chapter, Graham doesn’t just explain why it is a good practice to keep magical working secret, but explains in detail why it is so important. Further but goes into depth as to how to incorporate magic into a person’s daily life. 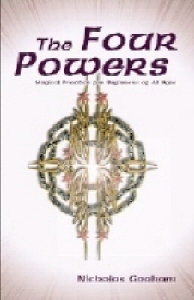 The Four Powers is an easy read. Everyone who picks up this book will be able to understand the contents. It is a bare bones approach to magic. It is practical, insightful and somewhat dry but I found it a fascinating read, and quite thought provoking. And even though I found the price a bit steep for such a small book, the information contained is well worth picking up. I highly recommend it.